Five people locked together using lock-on tubes blocking the only access road and denying entry to vehicles supplying equipment essential in the infrastructure and operation of the ALCAN smelter at Fort William, Scotland. The blockade started at the beginning of the morning shift change and lasted for almost five hours. ALCAN are a target because of their involvement in the destruction of the beautiful Icelandic wilderness. They are specifically supporting construction of new dams at Langisjór and Thjorsarver which are to power expansion of their existing plant at Straumsvík, just outside Reykjavik. Great areas of wilderness will be destroyed and the subsequent environmental damage and ecological instability will be beyond measure. Five people were arrested and have been charged with Breach of the Peace. “Our protest is designed to express our opposition to the proposed expansion of the aluminium smelters at Straumsvík (ALCAN) and Grundartangi (Century), as well as the construction of an anode factory at Katanes (R&D Carbon) and yet another Century smelter at Helguvik. We find it wholly unacceptable that the Faxaflói bay should become the most highly polluted area in Northern Europe, yet this is what will happen if these plans go ahead. The additional sacrifices of Iceland’s most precious natural jewels, the Ramsar protected wetlands of Thjorsarver and one of Europe’s most beautiful lakes, Langisjor, to facilitate the expansions of the ALCAN and Century smelters are completely unacceptable. 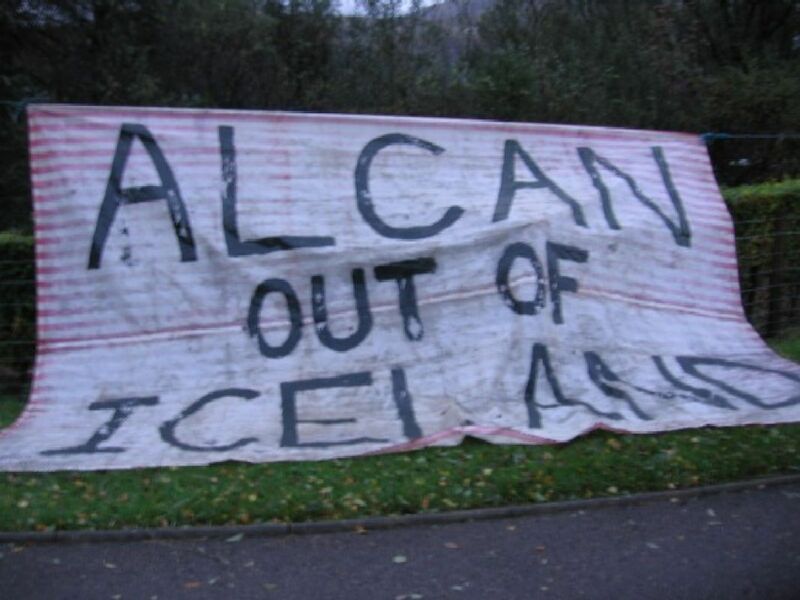 We also wish to show our solidarity with the people who have suffered from ALCAN’s immoral and inhuman working practices around the world; from the workers at Straumsvík who have contacted us to describe their unacceptable working conditions and the abuse of employees’ rights, to the inhabitants of the Kashipur district of India who have been fighting for twelve years against a planned bauxite mine and ALCAN aluminium plant which will force at least 20,000 people to leave their farm lands and will pollute their water supply ( see www.saanet.org ), not forgetting the residents of Hafnarfjördur in Iceland who are demanding a local referendum on the expansion of the ALCAN plant.